Founded in 1972 by Bob Hazard, the Myco Companies has been "the choice" for industrial businesses and government facilities in the Baltimore/Washington area who seek quality solutions to their cleaning equipment and detergent needs. At the Myco Companies, we are dedicated to helping customers analyze and solve high-pressure cleaning problems -everything from recommending the "right" piece of cleaning equipment to tackling water hardness to identifying local wastewater treatment regulations. As the experts in this area, we are well schooled in the sometimes complex formula of combining the right cleaning equipment with the ideal detergent or accessory to produce the fastest, most effective cleaning solution for your application. through a dedicated, professional staff. Today, the Company is owned and operated by Bob's son, John, and continues its success under the same two philosophies. Conveniently headquartered in Columbia, Maryland in a 9000 square foot, state-of-the-art office and warehouse, the Myco Companies has received numerous manufacturer's awards for excellence and its client list reads like a "who's who" of this areas leading businesses and organizations. We believe that our relationship with you doesn't end once the sale is made. In fact, it's just the beginning. We won't just sell you a piece of equipment and then walk away. Once you purchase your equipment from us, we assist in the proper training of your employees to assure their health and safety and provide ongoing partnership support. Continued Sales & Service Support. The Myco Companies provides a detailed installation and training program for your employees, and will distribute materials for future necessary training. Plus, your sales consultant is always just a phone call away. Experienced, knowledgable sales professionals offering fast, carefully thought out strategies for your cleaning objectives. 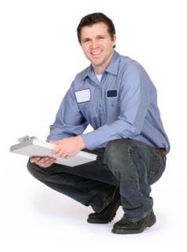 Courteous, factory-trained service technicians providing reliable work to get you back up and running. Computerized schedule system delivering quick response to your service requests - usually within 24 hours.